Just look at those adorable almond shaped eyes. 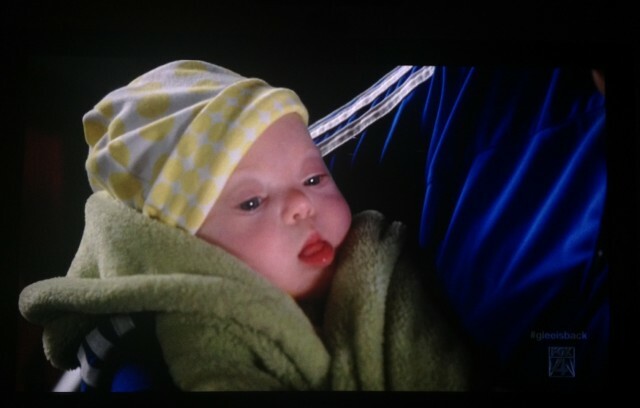 If you were watching the season premiere of Glee tonight you saw Sue Sylvester’s adorable new baby girl briefly at the beginning of the show. Did you notice that Sue Sylveter’s baby has a little something extra? As in an extra copy of her21st Chromosome! Yelp, that’s right, Sue’s baby girl has Down syndrome?! Cool, huh?! Did you notice? To be honest if it wasn’t for my wife giving me a heads up I wouldn’t have noticed. She’s a huge Glee fan and keeps up with all of the Glee gossip. After last season, rumors started popping up online that Sue’s daughter was going to be born with Down syndrome, but it wasn’t until recently that it was confirmed. Needless to say, I thought it was super cool! I’ve gotta say, I don’t really watch Glee (although I do enjoy some of the music!) but I almost want to start watching if nothing more than to support their efforts to help change our cultures view of people with Down syndrome. In case you didn’t know this is the 3rd person with Down syndrome to have an ongoing role on the show. There’s Becky, Sue’s sister, and now Sue’s daughter, Robin. By the way Robin Sylvester is really 7th month old Jordyn Kindle Orr! As a father of a child born with Down syndrome I applaud the producers of Glee for the efforts to promote and encourage inclusion, be it ever so slightly. I kept watching tonight’s episode in hopes of seeing more of Sue’s daughter, Robin, and to see what the writers were going to do with Sue Sylvester’s character and storyline. I’m very curious to see if they explore how Sue feeling about having a child with Down syndrome, if she knew ahead of time through prenatal testing, etc. I really do hope we get to see more of her and her new daughter Robyn this season! I think it’s fab that Glee supports this view and includes people and now babies with DS. My son Alex will be 27 on 20th Feb, and I can honestly say, he is the most awesome guy I know. I have him to thank for being where I am now, he has inspiresd so many people in his life and is pure gold. I wish all people could understand the joy having a child with DS can bring, and trust enough to walk that path alongside them. I think this is pretty pathetic. We know she has down syndrome from season three episode sixteen. When the doctor says something about “irregularities” with the baby. I personally thought it was obvious at that time that the baby would have down syndrome. Then when I saw the baby I knew she had down syndrome and I wasn’t surprised. But the fact that even after all that obviousness some people still didn’t get it? Wow.